An official Guardian editorial (Gaza: storm before the quiet, Nov. 21) on talks of a ceasefire between Israel and Hamas cited legitimate claims of victory both sides could make if a truce is signed. [Netanyahu] can say that while Gilad Shalit is back with his family, the man who kidnapped him, Hamas’s military chief Ahmed al-Jaabari, is dead; he can say that the stock of missiles in Gaza is depleted and that the Iron Dome missile defence system proved itself. He can say the operation gave the lie to those who claimed Israel cannot act militarily now that the regional environment has been changed by the Arab spring. It is worth noting that the Guardian is once again suggesting that Hamas, unlike the “craven” Palestinian leaders in Fatah, is more deserving of our moral sympathy, more justified in claiming the mantle of the authentic Palestinian resistance movement. 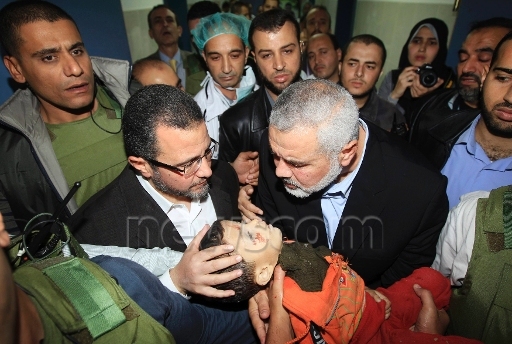 Further, the picture of the Egyptian prime minister clutching a dead Gazan child, which the Guardian is referring to, is an incident which was revealed to be a fraud. Though media reports initially claimed the child in question, 4-year-old Mahmoud Sadallah, was killed by an Israeli strike, it later was revealed that he was almost certainly killed by an errant Hamas rocket. This cynical manipulation of a dead Palestinian boy to score public relation points should be a source of shame for Hamas, not a source of pride. However, as long as the Guardian remains enamored of Hamas, and sympathetic to their claims of legitimacy, don’t expect even the most specious moral and political claims by the Islamist group to be subjected to critical scrutiny. Sigh. The Guardian editorial said nothing of the sort. It said that Israel will say this and Hamas will say that. I wonder if Steve Bell or Carlos Lautuff will be penning an appropriate cartoon? I wonder if realzionist or pretzelberg will give it a rest? What exactly is your problem with my post above?! A Latuff fan, are you? Perhaps because there was no effort at all to correct the lie that this baby was killed by Israel? The editorial also describes Gazans hiding from Israeli shells (with no mention at all of Israelis hiding from Gazan rockets) and states, in the context of this shelling by Israel that “Hamas and the Egyptian president, Mohamed Morsi, claimed earlier in the day that they had a deal. If so, this would not be the first time an armistice had been shot out of their hands.” The implication is clear – that Egypt and Hamas want a ceasefire, but Israeli violence has stymied it. Quite apart from the whitewashing from this analysis of the continuing barrage of rockets being fired at Israeli civilians from Gaza is the dubious value of a deal agreed between one party to the conflict (Hamas) and one of its sponsors (the MB in Egypt) whithout any reference to Israel’s position. How can the Guardian implicitly blame Israel for blasting away a ceasefire agreement in which Israel apparently had no say whatsoever? Your points are perfectly valid – but where does the G. “claim Hamas scored political points from photo of Egypt PM cradling dead baby”? Bus bombing in Telaviv! RZ ,care to comment,…. Sure. What kind of world do you want to live in ? Ed, more than 20 Palestinian children were killed in Israeli airstrikes on Gaza, including several newborns. Your despise for human life makes me sick. I’m sure you are also upset by the Arab kids which are being abused and killed by their own side for propaganda purpose? Or are should they not be criticised because they are Arabs?